Sergeant First-Class Brandon Keeler joins UI sophomore Megan Reaska, the Iowa National Guard's first female combat engineer, at her enlistment ceremony. 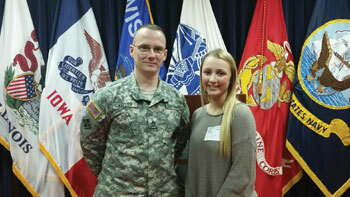 "It's exciting that this opportunity has come, and Megan has definitely accepted the challenge," says Keeler, Reaska's recruiter at the Iowa City National Guard Readiness Center. "She's pretty strong-minded and driven." When Megan Reaska joined the Iowa National Guard late last year, she didn't realize that in addition to building bridges and detonating explosives, she'd also be breaking down barriers. Yet shortly after her swearing-in ceremony in Des Moines, the UI sophomore learned she would be the first female combat engineer in Iowa National Guard history–and only the third woman in the state to join a combat arms unit. U.S. Defense Secretary Ash Carter recently ordered that all military positions–including combat roles–be opened to women at the start of this year. "It's an honor to be the first in Iowa and to show that a woman can do what men can," says Reaska. "I don't expect to be pampered; I expect to be treated like everyone else." The Iowa National Guard offers students like Reaska a scholarship to both serve and attend college at the same time. With encouragement from her father, Reaska decided to honor her family's rich military heritage, which includes her Vietnam Marine veteran grandfather and her uncle, a member of the Illinois National Guard. Reaska comes from a family with an appreciation for mechanics, hunting, and the outdoors, so the combat engineer position instantly appealed to her. Combat engineers construct bridges, roads, trenches, and buildings to assist their fellow soldiers, while impeding enemies by demolishing their infrastructure. Reaska will attend Basic Training and Advanced Individual Training this summer at Fort Leonard Wood, Missouri. Already, she says the military feels like a second family. Though Reaska is majoring in therapeutic recreation with a minor in human relations, she also has considered becoming an officer through the Reserve Officer Training Corps (ROTC). Regardless of her future career path, she says, "The skills I learn while in training, I'll carry with me forever." Last fall, recently retired NFL player Casey Wiegmann returned to Kinnick to be recognized as the first America Needs Farmers honoree.